Last week in part 3 of our Recorder in the Classroom series, we saw some of our most enthusiastic students getting together to practice together in small groups. This week we will look at music practice as an ensemble. After warming up and having fun performing extra pieces some students had learned, our recorder students then focus on practicing their group piece as an ensemble. Through lots of hard work week-on-week, the students learn to listen to each other and play in harmony. 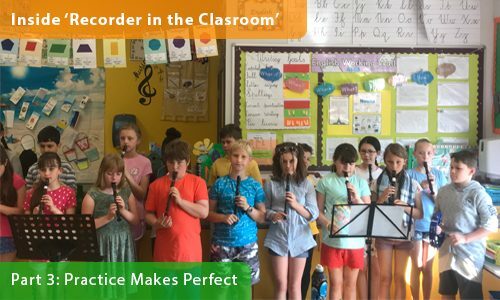 Recorder in the Classroom is one of our most successful music programmes with tangible results. Students starting out with no musical experience are able to read music notation and improve their musical awareness through fun, interactive practice every week. Inside ‘Recorder in the Classroom’ – Part 4: Performing as an Ensemble coming next week!